One bite of US Wellness Meats’ Chicken Apple Sausage Links and you will see why they are a customer favorite! Chicken Apple Sausage Links are raw and ready to be grilled or cooked on the stovetop for a great tasting breakfast or light lunch. Savory flavor with a touch of sweet! The chicken used in this product is free roam, antibiotic free, and receive a GMO free corn and soy poultry diet. No chemical nitrates/nitrites, added fillers, dyes, artificial ingredients or preservatives. All of our farms uphold the highest sustainable farming standards. Chickens are allowed to roam free and root for food in pastures. Ingredients: chicken, apples, water, salt, spices (including pepper), and sugar in pork casing. 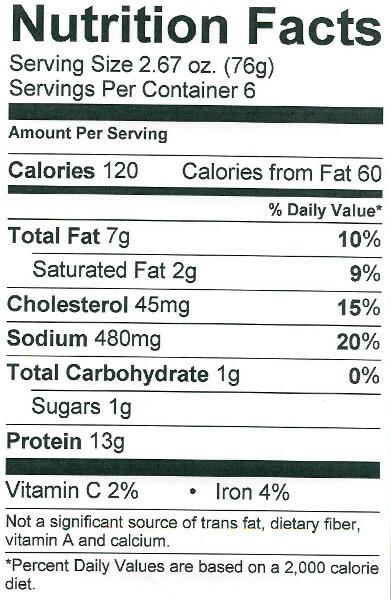 Each Chicken Apple Sausage Links package contains 5-6 links and weighs approximately 1 pound. They are delicious. I do not get tired to eat this sausages. Easy to cook and very versatile. These sausages are awesome. I will definitely be ordering more. My favorite change up from chicken breasts! WoW! These are seriously amazing. We eat them for breakfast and the other night i made pizza with them. I took the casing off and fried it up then added it to the pizza and baked..I can't say enough how fab these are. These are unbelievably delicious. I wasn't expecting much because I'm not really a fan of ground chicken, to begin with, nor am I a big fan of sausage in general. These are incredible and I hope they continue to carry them and restock them soon because I'd love to order more. Very good. Like another customer commented, I prefer to cut the casing off and cook it up loose style. These sausages taste great! They are somewhere in between mild and medium spicyness (at least to me). I will be ordering them again. These were delicious! We had them for breakfast and dinner. I am placing my order for more today. Bought these several months ago and just now reviewing them. Good flavor, but too sweet, and too watery. Did not fry up (probably because of the apple and watery texture). Will not buy again even though the price is right.